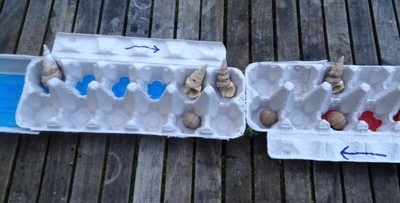 This game is a mixture of Mancala and Ludo, played on a egg carton 'board' with shell and nut playing pieces. A preschooler can play this version but you could invent some extra rules if you want make it harder. This version is designed for 2 players. 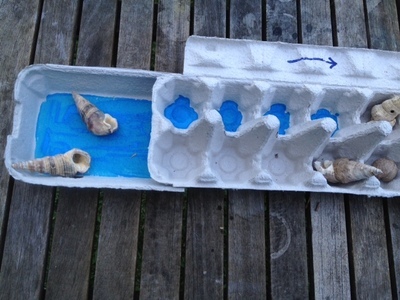 Cut the top off both egg cartons and set to the side. 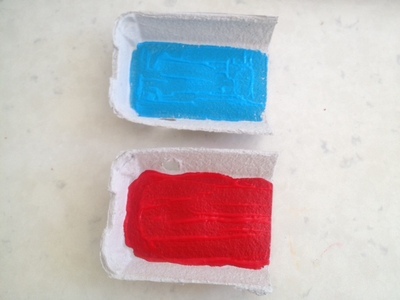 Paint a long line of 4 dots in red paint in the cups of one of the egg carton boxes. Paint a long line of 4 dots of blue paint in the other (see photo). 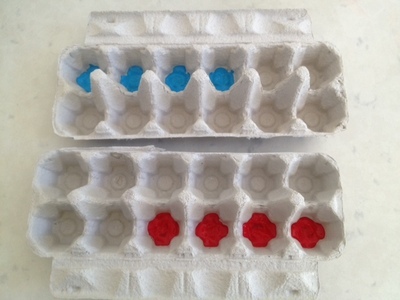 Cut one of the egg carton lids in half and paint one half red and the other blue. The board is now ready to assemble. Line the cartons up to make a long board, with the coloured dots on opposite sides and ends. Slide a coloured half lid under each end of the board. The red lid should be next to the red dots and the blue lid next to the blue dots. Draw a clockwise arrow on the edge of each box (see photo). This shows which way the counters will move around the board. Put a counter in each of the four coloured Starting Position dots. 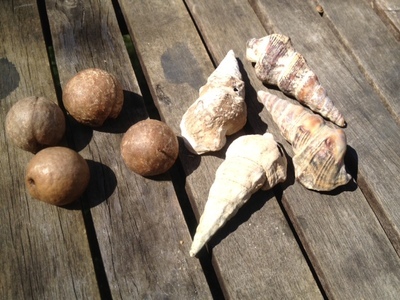 We put the four shells in the four blue dots and the four nuts in the four red dots. The game is now ready to play! The idea of the game is to get all your counters around the board and back Home. The coloured dots are the "Start Positions" and the coloured lids are "Home". 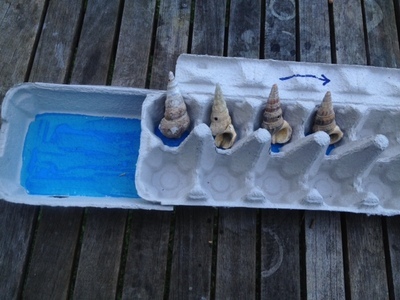 Player 1 chooses blue/shells. Player 2 chooses red/nuts. 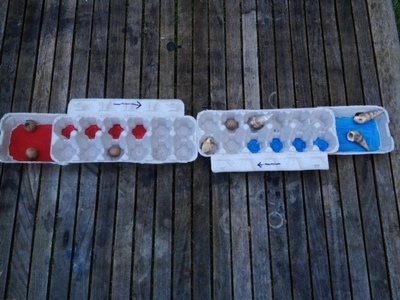 Player 1 rolls the dice and moves a shell that number of places off a blue Start Position dot. If a player rolls a 6, have another turn. Player 2 rolls the dice and moves a nut that number of places off a red Start Position dot. Keep taking turns and moving round the board in a u-shape following the direction of the arrows until landing safely into the player's Home zone. You can't land on a cup which already has one of your own counters in it. You may need to miss a turn if you can't move. If you land on one of your opponent's pieces, you can send it back to a Start Position. So cool, have to try this with the grandies!